Ceramic and porcelain tiles are widely used in our homes in kitchens, bathrooms, conservatories and other rooms, and the laying of these tiles on either floors or walls can often be tackled as a DIY task in your new home. Laying straight lines of tiles is a relatively easy job as is making straight cuts in the tiles, but rooms are rarely perfectly square around the edges and it is the finish around the edges that is the most difficult to get right. A good quality tile cutter is perfect for cutting clean straight lines but where water pipes protrude from the walls or radiator pipes from the floor you will need to cut a hole in the tile. Other obstructions may need more unusual shaped sections to be cut from the tiles. For small holes you will be able to use a drill on a very slow speed with a special tile bit that has a diamond or tungsten carbide bit. Always drill from the back of the tile where possible so that the drill bit does not slip on the smooth, finished surface. 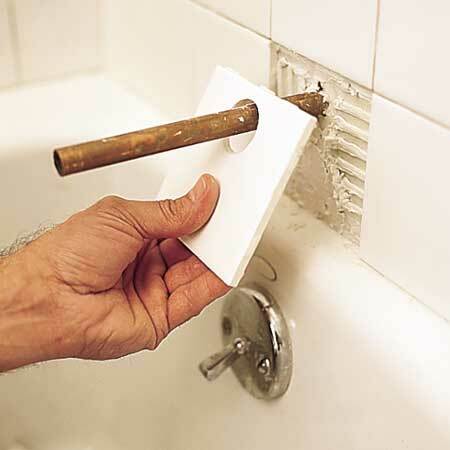 If the tile has already been installed and you have to drill from the front, particularly in the case of drilling holes for bathroom accessories such as towel rails or bathroom cabinets that will be positioned after the tiling has been completed, then be sure to stick masking tape over the area to be drilled to prevent slipping. When drilling porcelain tiles, which are much harder than ceramic tiles, you may need to keep the bit cool with water as you are drilling. Mark on the back of the tile the size of the hole required, then drill a small hole at the centre. Use a tile saw to cut from the hole at the centre to the outer edge and then cut around the marking until the whole section has been removed. Make a series of small holes with a drill around the circumference of the hole required. The disadvantage of this method is that the edges of the hole will be jagged so this may be unacceptable depending on the location of the hole and how visible it will be. It is sometimes possible to smooth the jagged edge with a tile file. To cut irregular shapes from a tile you can also use a tile saw, or a tile nipper, depending on the size of the section to be removed. This blog post is really interesting, it covers one of those tasks that everyone tiling a room should know how to do but it is not described in detail anywhere else. Next story What Type of Flooring Should You Select for Your Kitchen Remodel?